Like many other tech companies, we used to have an unlimited vacation policy as a way to encourage employees to take vacation days when it felt best to them. When unlimited vacation didn’t seem to be working, because it’s hard to tell how much time unlimited really is, we switched to a minimum vacation policy this time last year. Our solution to getting people at Buffer to take more time off was to set a standard minimum vacation time of three weeks per year for the whole company, in the hopes that we might inch our team towards the 15- to 20-days range of vacation time. Now that a year of experimenting with minimum vacation has passed, we’re excited to share an updated analysis and a look at whether we’re getting any better at taking time off. How Much Vacation Time Do We Take With Minimum Vacation? 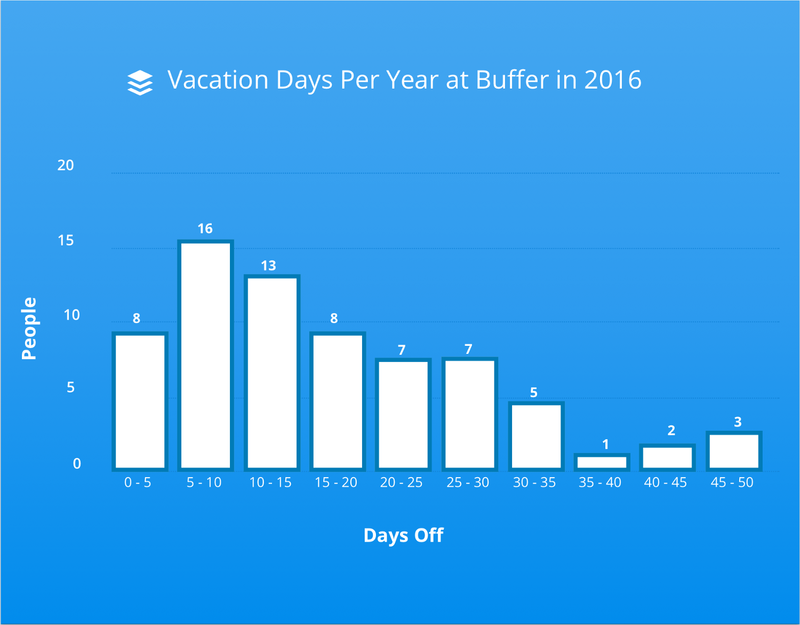 We just ran another analysis and discovered that the average number of vacation days taken by Buffer employees in the past year is 18.2. 89% of the company has taken more than ten days off. This increase to an average of 18.2 days feels like excellent progress from having the 5–10 day range be the most popular when we ran this analysis last year. It’s especially great to see that while last year 24 people took 10 or fewer days off, this year that number was down to 8 people. A note here, you might be asking how people can take less than 15 days if we have a minimum vacation policy. Well, the answer is that while we sent gentle reminders to employees who haven’t taken enough time off (more on that below) we don’t force employees to take vacation days. Something we have been experimenting with, though, is closing down Buffer during certain holidays so that more people enjoy time off. We’ll be sharing a post with a bit more on that soon. For reference, 49% of our employees are in North America (primarily the U.S.), closely followed by Europe 38%. We also looked at how much vacation each team was taking. It’s inspiring to see our executive team leading the way on this one. We’ll dive a little bit more into why this has been so powerful below. There are a couple of deliberate actions we took that may have led to this policy being more successful. We didn’t just tell the team “Please take 15 days off every year from now on.” Our People Team sent out a team-wide announcement and made sure the whole team understood what might be a good amount of vacation for their country. They also explained when people at Buffer could start taking time off and clarified some questions that are common around vacation time. We encourage team members to take a minimum of 3 weeks (15 work days) of vacation time throughout the year, in addition to the holidays (bank, religious or otherwise) you choose to observe. Buffer is privileged to be a global team; please take time off that’s in line with your country’s standards if it’s generally a bit more than our recommendation. It’s generally great to begin to take time off after you’ve been at Buffer for about 3 months. (If you’re newer to the team and have something already planned, no worries! We’ll take it case by case). This time is separate from holidays that you choose to celebrate, and outside of sick/personal days, bereavement/compassionate leave, and family leave. Did you notice which team took the most time off? The executive team, which is quite awesome to see. Right after this policy went live last year, our CEO Joel sent out a Discourse sharing the 14 days he’d be taking off between September and November while he did some traveling. When he got back in November, he sent another company-wide Discourse reminding the team of the importance of self-care and sharing some beautiful photos. It can be hard for employees to take vacation time if they see the people in leadership failing to do so themselves, which is why it was so powerful to have managers at Buffer taking time off and leading by example. Old habits are hard to break, even with new policies in place. Our People Teamtook things into their own hands and kept a watchful eye on how much vacation time people were taking off to make sure no one forgot the new policy. When the People Team saw that someone hadn’t taken any time off yet, or hadn’t taken time off in a while, they reached out to that person’s manager so that a gentle reminder could be given in their next 1:1 session. How much vacation time have you taken off this year? What sort of policy does your company have? I’d love to discuss in the comments! Big thank you to our Data Analyst Julian for combing through the vacation data on this one to find all of this information. Originally published at open.buffer.com on October 4, 2017.